This seminar focuses on clinical applications of neuroscience, studying the emotional, memory, and cognitive systems of the brain in order to more deeply understand psychoanalytic concepts and intervene more effectively with our patients. 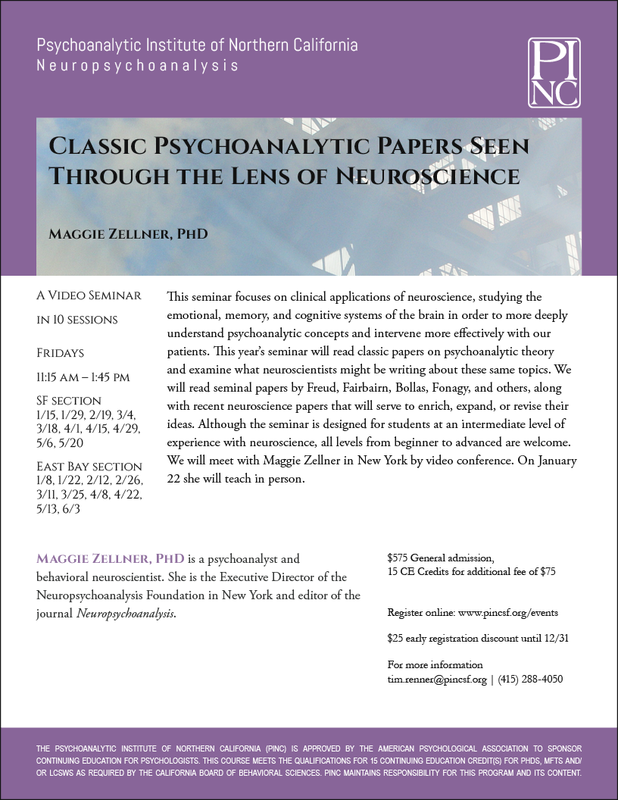 This year’s seminar will read classic papers on psychoanalytic theory and examine what neuroscientists might be writing about these same topics. We will read seminal papers by Freud, Fairbairn, Bollas, Fonagy, and others, along with recent neuroscience papers that will serve to enrich, expand, or revise their ideas. Although the seminar is designed for students at an intermediate level of experience with neuroscience, all levels from beginner to advanced are welcome. We will meet with Maggie Zellner in New York by video conference. On January 22 she will teach in person.